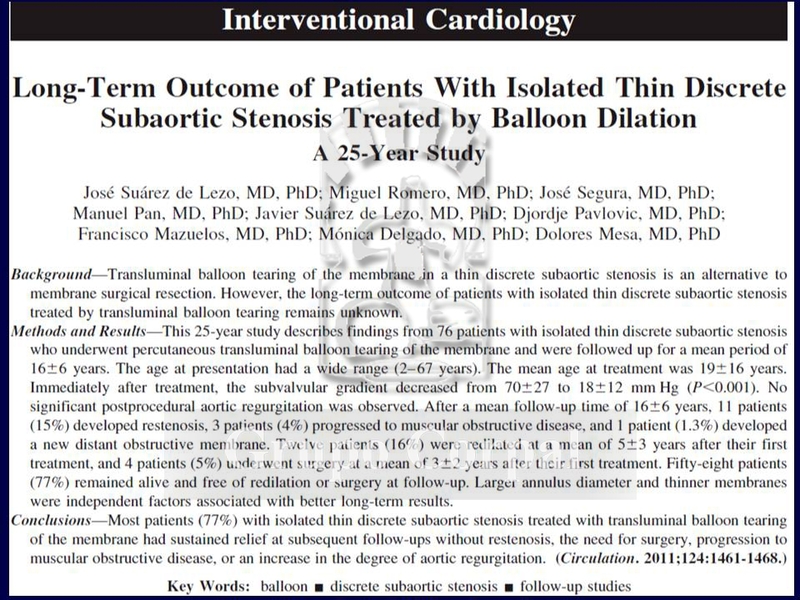 Dilation of Discrete Subaortic Stenosis, mechanical treatment. 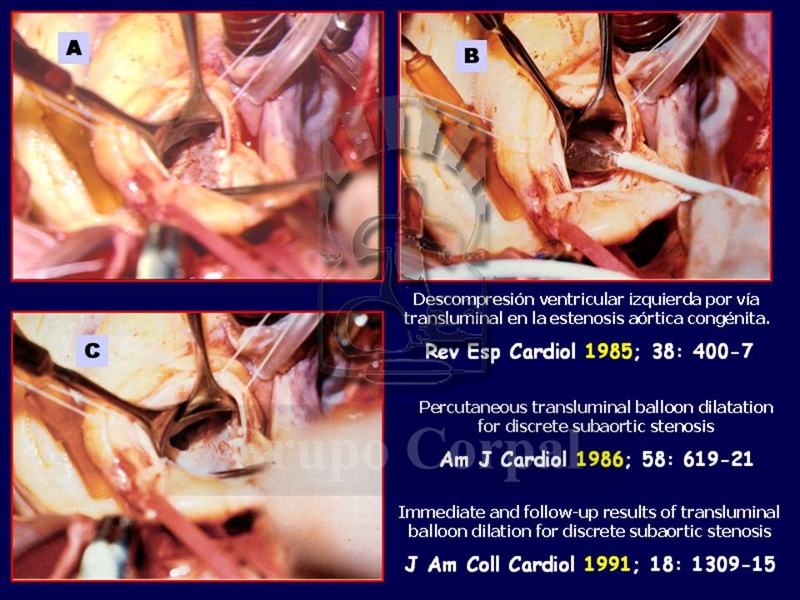 Sub-aortic stenosis represents a mechanical obstacle for ventricular ejection located just beneath the aortic valve, in the left ventricle outflow track. It is a rare, mysterious, disease of which we know little. 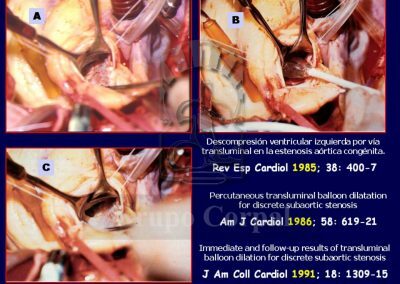 From an anatomical perspective, on 85% of all occasions the obstructive mechanism is based on a fine sub-aortic membrane that, acting like a diaphragm, produces obstruction to ventricular ejection. The tissue involved is similar to that of the endocardium, and can grow in half-moon shape or create a complete diaphragm. It can also create branches growing towards and coming into contact with the fibrous ring of the aortic or even mitral valve. It was always considered to be of congenital origin, as it is largely diagnosed in children and young adults, but it has been found that it can be acquired by people born without the condition. 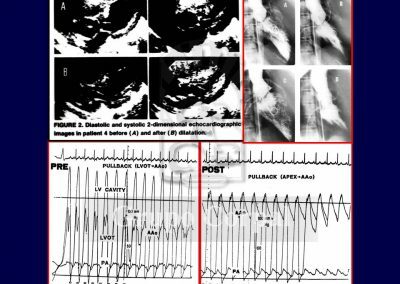 From a physiopathological perspective, the membrane produces a fixed sub-valvular obstruction, similar to aortic valve stenosis, for which it is often mistaken. 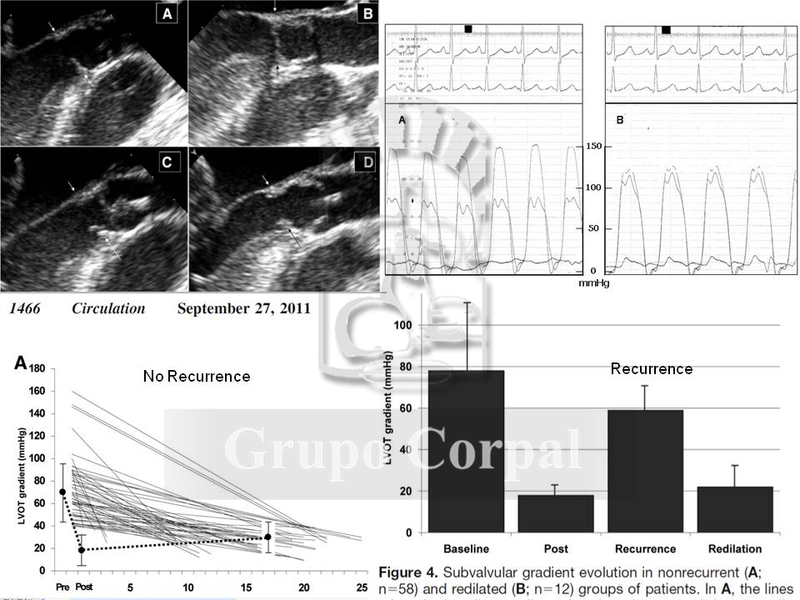 At each heartbeat the narrow sub-valvular area generates a high pressure jet that hits the aortic sigmoid leaflets, which are often damages, creating associated valve insufficiency. The pressure overload produced in the left ventricle is a constant threat for the production of ventricular hypertrophy. The disease’s progressive nature is also a mystery. Progression can be in haemodynamic severity. For some unknown reason, the obstruction can progress from mild to very severe, with a significant increase in the sub-valvular pressure gradient. Mild cases therefore require close monitoring. On the other hand, progression can also be to muscular obstruction, with the membrane becoming a sub-aortic muscular tunnel. Some believe that the membrane is an initial phase of the disease which, stimulated by intraventricular hypertension, can progress to obstructive muscular disease, which is harder to resolve. When this is found, there are often traces of membrane on the edges of the tunnel. This condition corresponds to the remaining 15% of fixed sub-valvular obstructions, possibly final stages of the same disease. Classic treatment was always surgical. 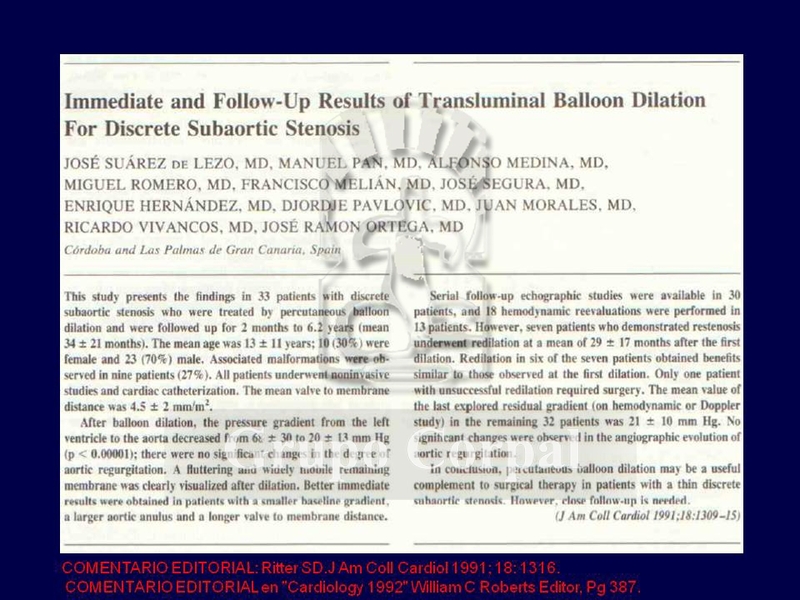 The surgeon resects the membrane via sternotomy and extracorporeal circulation. Numerous surgical techniques have been described to prevent its reproduction, which is common, and the recommendations were for enucleation of the membrane plus myotomy or myectomy, techniques that are much more aggressive than mere resection. These techniques, however, have not shown superiority. Recurrence continues to be a problem. Although surgery is palliative, it continues to be the treatment of choice at many sites. In 1985, for the first time in the world, our group described a different kind of mechanical treatment for removing sub-valvular obstruction (Reference). If the membrane is thin, with no muscular component, it can be broken or torn by dilation with balloon catheter. 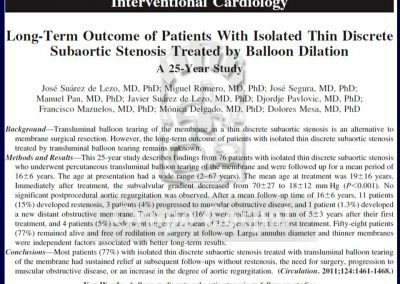 The procedure is simple and effective for removing fixed sub-valvular obstruction and even has beneficial effects on the aortic valve, which ceases to suffer the high pressure jet at each heartbeat. 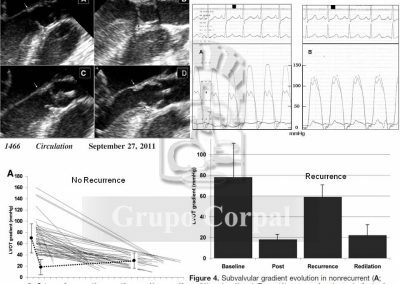 If the procedure is performed promptly, the course of the condition improves as there is no long the stimulus of intraventricular hypertension for the development of hypertrophy. 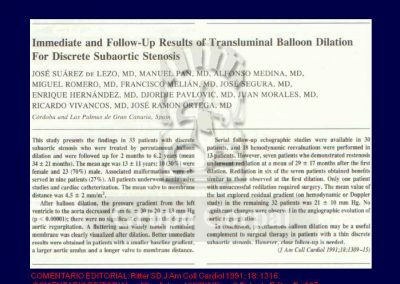 Although this treatment is also palliative, as is surgery, in a progressive disease recurrence over 25 years is 15%, and the procedure can be performed again if necessary. Our group has conducted long-term follow-up studies that have shown great efficacy providing patient screening is appropriate, with thin membranes with no muscular components (References…).